Heroic Heart’s welcomes you to our sponsorship program! Your contribution of $50 per month can provide basic life giving necessities such as food, clothing and water and lift a child and his/her family out of a life of poverty. You are entitled to cancel your subscription at any time. If interested, please inquire about correspondence with sponsored orphans as this may be possible for orphans living in certain areas we support. 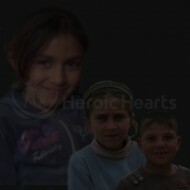 HHO is dedicated to bringing lasting and positive change to lives of those suffering in war-ravaged communities. Learn more about why HHO was started and our mission.. Learn what makes us different from other relief organizations and why your contribution will go the furthest with HHO. Feel free to peruse and educate yourself on our various programs and initiatives. We only want you to contribute with 100% confidence in HHO. Copyright © 2016 Heroic Hearts Org. All Rights Reserved.